What specific conditions are shown in disease models? Many different disease models are available today to show everything from degenerative bone loss through to abnormalities of the prostate. Common models used in most hospital and health care settings include those showing stomach cancer, kidney disease, lung disease, breast cancer, colorectal cancer and skin cancer. 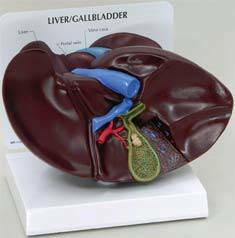 However, other organs that are prone to specific types of cancers and diseases such as the liver, pancreas, gallbladder and spleen, colon and the digestive system are also represented with models. A hypertension model provides information on all the organs that this condition effects, really making a dramatic presentation to patients where this is a concern. How do patients typically react to being shown a disease model? If I do use the model what should I expect? Most patients react extremely positively to the use of disease models during a diagnosis or consultation. The models are lifelike and realistic, but they aren't as graphic or shocking as looking at actual body parts in photographs and videos. Since the patient is not negatively affected by seeing the model they are better able to hear and comprehend the information the medical staff is providing. The use of models may also generate more questions from the patient during and after the doctor's discussion. This is a very positive sign that the patient understands the disease and is focusing in on the consultation. Are disease models helpful in assisting patients in understanding why early intervention is important in many types of diseases? Many of the disease models are designed to show the stages or degeneration of the body over the course of a disease. This can be very helpful in showing patients the progression of the medical condition and what they can expect. They can be very important in explaining the stages of cancer, osteoporosis, digestive disorders, arthritis and reproductive health issues. Having disease models to share with patients that may not understand that immediate or aggressive treatment is to their benefit is essential. The physician can use the model to create a visual impression of how the disease will progress. The patient can both see and hear the information which will help them make an informed decision. In some cases the models can be used with family members that may be making the decision on behalf of a patient. Is it possible to have a custom made disease model? Not all medical model companies offer the option to customize or create new and unique models based on a particular client's needs. The good news is that some companies do allow custom models, which can include disease models. For highly specialized practices, advanced medical classes and working with specific types of patients customized models may be just the answer. Custom models are typically more expensive than a stock type of model since they are unique and must be created from a one of a kind mold. Working with the medical model company in drafting and designing the model will be important to make sure you get just what you want.